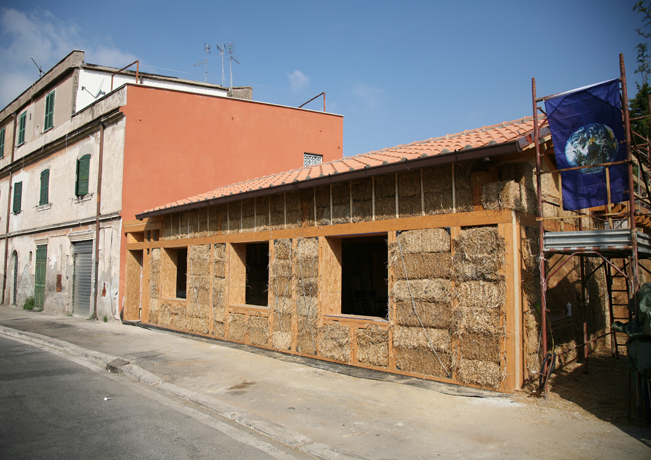 Seeking to change the perception that straw bale buildings are only suitable for rural areas, Beyond Architecture Group Officinamobile (BAG) recently built Rome’s first straw bale home! The energy-efficient space was designed by a group of students and it’s made entirely from local materials. Located in the Roman capital’s Quadraro neighborhood, the straw bale house was made from a local wood structure, and the walls were filled with straw bale that was previously mixed with crushed bricks and mud. And the plaster they’re using is made from a mix of crushed bricks and local dirt, which will give the house an earthy tone. Although it’s still a work-in-progress, the great thing about straw bale shelters is that are very energy-efficient as its porous properties keeps the interior warm in winter and cool in summer. Seeking to change the perception that straw bale buildings are only suitable for rural areas, Beyond Architecture Group Officinamobile (BAG) recently built Rome's first straw bale home! The energy-efficient space was designed by a group of students and it's made entirely from local materials.